Pool Step Covers Provide Safety & Security! 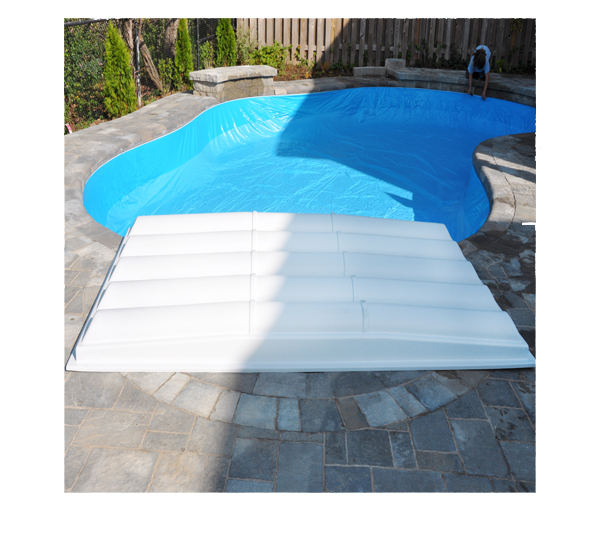 Pool Step Covers help to provide additional safety and security when winterizing and closing your inground or onground pool. The high-impact resistive strength and flexibility of the weather-able polymers used in our covers enables our Covers to withstand the stress of frost, heavy snow and the freezing cold far better than similar materials that are used in other covers. The unique bowed shape helps to provide an upward rise in the centre of the cover that helps water and snow drain with ease. Our step covers are available in 4′, 6′ and 8′ sizes, depending on the size of your pool’s step.